Hidden away in sleepy northern England is an engineering company with a radical idea: it claims to be able to make gas, to run your car, out of air. Is this the solution to the global fuel crisis, or wild hyperbole? 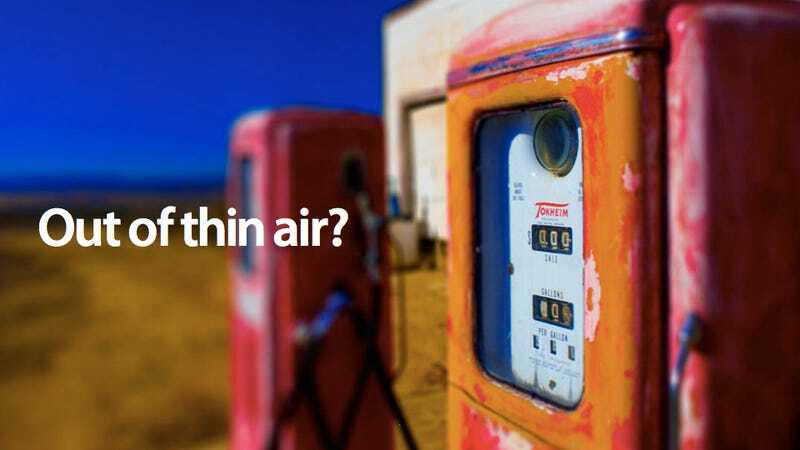 The company, called Air Fuel Synthesis, revealed its research at a London-based engineering conference this week, claiming that not only can it make gas from air, but that it actually removes carbon dioxide from the atmosphere, too. It sounds miraculous. So, how do they claim to be able to do it? First, apparently, they take sodium hydroxide and mix it with carbon dioxide from the atmosphere. That produces sodium carbonate, which can then be electrolyzed to form purer carbon dioxide. The CO2 is then combined with hydrogen—produced by electrolyzing water vapor captured with a dehumidifier—to produce methanol. Finally, that methanol is passed through a gasoline fuel reactor—which uses some nifty organic chemistry once developed by Mobil—to create... gas! Admittedly, not a lot of gas, but gas nonetheless. The company has been running what it refers to as a "small refinery" for three months and produced... five liters. Solving the global fuel crisis, it is not. "It sounds too good to be true, but it is true. They are doing it and I've been up there myself and seen it. The innovation is that they have made it happen as a process. It's a small pilot plant capturing air and extracting CO2 from it based on well known principles. It uses well-known and well-established components but what is exciting is that they have put the whole thing together and shown that it can work."